Children must have completed first grade OR be age 7 to attend BookTrails Camp. The grades listed for each camp can be EITHER the grade entering or exiting. We are flexible because reading level can vary greatly from student to student, regardless of their grade level. 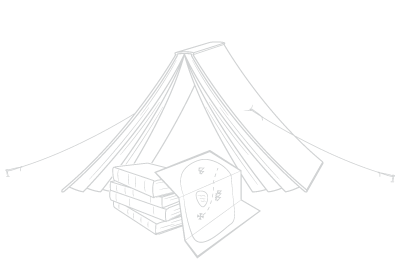 The important consideration that parents should make is whether your child is ready for a camp with a camp-out and if they are engaged with the book choice. You will need your child’s dentist and doctors names, phone numbers, and addresses to register. If you are applying for a scholarship, please apply on this page and wait for your scholarship to be reviewed and approved before registering. Thanks for registering for BookTrails Camp! We can’t wait to see your child this summer! BookTrails strives to provide scholarships for students who wish to attend our camps, but cannot afford registration fees. Please fill-out the form below if you wish to apply for a scholarship. After the scholarship is approved, you will be able to register your child. Please do not register your child before you are approved for a scholarship, as we will not reimburse any fees that are paid during registration before approval. *effective 4/8/2019 we have allocated scholarship funds and are now only accepting applications for the scholarship waitlist. By registering a child in a BookTrails program, you agree to all policies and regulations. Please read carefully.